Guleesh and the Princess of France ~ Fairy Tale Stories for Kids No Reviews Posted. There was once a boy in Ireland, and Guleesh was his name. A little way off from Guleesh's house stood a very old round fort, an ancient fort it was, that was called a rath. At midnight one night, Guleesh was leaning against a wall of the rath and looking up at the beautiful white moon. He thought with longing, "Nothing happens here! If only I were in any other place in the world but here!" Suddenly he heard a great noise coming toward him like the sound of many people running together. The sound rushed up in what looked like a huge whirlwind. Then he heard voices crying out from inside the whirlwind: "My horse, my bridle and saddle! My horse, my bridle and saddle!" "They sound merry enough," said Guleesh, "What if I could join them?" And he called out, too, "My horse, my bridle and saddle!" That moment a fine horse with a bridle of gold and a saddle of silver appeared before Guleesh. So he leaped upon it. As soon as he was on the back of the horse, he saw clearly that all around the rath, beautiful horses were speeding along, each one ridden by a little fairy man. Said one of the fairy men to Guleesh, "So! Are you coming with us tonight, Guleesh?" "Why not?" said Guleesh. The wind rushed by his hair and thought to himself, "At last, an adventure!" They all rode together, riding like the wind. They did not stop until they came to an ocean. Then every one of the fairy men cried out, "Hie over cap!" As soon as they said those words, each fairy man's horse rose up into the air and raced over the sea. So Guleesh called out those very same words. And before he knew it his horse, too, rode over the sea and sped over the blue water. When they landed on the other side onto dry land, one of the fairy men said to Guleesh, "Guleesh, do you know where you are now?" "Not a bit," said Guleesh. "You're in France," said he. "The daughter of the king of France is to be married tonight. Princess Isabel is her name, and she is a treasure to be sure. We mean to see to it that she goes back with us! You must put the young girl up behind you on your horse, for it's not lawful for us to put her sitting behind ourselves. But you're flesh and blood, and she can take a good grip of you so she won't fall off the horse. Will you do what we're telling you to do, Guleesh?" This was not was Guleesh was expecting. But then again, he thought, what did he expect? So he said, "Very well. I've come this far with you." The fairy men got off their horses. One of them said a word that Guleesh did not understand. Then Guleesh found himself and his companions inside a palace. There was a great feast going on there, and the night was as bright as the day with all the lamps and candles that were lit inside. The musicians were at the two ends of the hall, and they were playing the sweetest music that ever a man's ear did hear. Youths and members of the court were dancing and turning, making fun and laughing. Such a feast as that one had not been seen in France for twenty years. For the old king had no children alive but only the one daughter, and she was to be married to the son of another king that very night. Three days the feast was going on, and the third night she was to be married, and that was the night that Guleesh appeared. Guleesh and his companions were standing together at the head of the hall, where the girl stood waiting to be married. But nobody could see the fairy men, for they said a few words as they had come in that had made them all invisible. "Tell me which of them is Princess Isabel," said Guleesh. "Who else could it be?" said one little man. "Don't you see that the princess is over there?" Guleesh looked where the little man was pointing with his finger. There he saw a young woman adorned with all the fineries a princess could wear. But when he looked again, he saw that there was the trace of tears in her eyes. "How can it be," said Guleesh, "that there's grief on her? Everybody around her is full of merrymaking." "She is grieved," said the little fairy man, "for it's against her own will that she's marrying, and she has no love for the husband she is to marry. The king was going to give her to that prince three years ago when she was only fifteen, but she said she was too young. The king gave her a year's grace. When that year was up he gave her another year's grace, and then another. But a week or a day more he would not give her and she is eighteen years old tonight, and so now it is time for her to marry. But indeed," said he, and he crooked his mouth in an evil way, "she need not worry about marrying this prince. She will come home with us instead! She will be our bride, if WE have anything to say about it!" When Guleesh heard that, he was heart-broken to think that the Princess Isabel would either have to marry a man she did not like or, what was worse, would end up with a nasty fairy man for a husband. He couldn't help but curse the ill-luck that brought him to be helping the very ones who intended to steal this young woman away from her home and father. He began to think what he could do to save her, but could think of nothing. Just then the prince she was to marry came up to Princess Isabel for a kiss, but she turned her head away from him. Still, the lad took her by the hand and drew her out to dance. They went around on the dance floor to near where Guleesh was standing, and he could plainly see tears glistening in her eyes. When the dancing was over, the old king, her father, came up and said that this was the right time for the wedding ceremony to take place. It was time for the prince to put the wedding-ring on his daughter's finger. Then one of the fairy men, who was invisible to all, stretched out his foot before the girl and she fell. Before she was able to rise again another one threw something that was in his hand upon her, and said a couple of magic words. At that moment, the maiden seemed to vanish. Nobody could see her, for his words had made her invisible. But seen by the fairy men she was, and one of them caught her and held her in place. O! It's there the pity was, and the trouble, and the crying, and the wonder, and the searching, when that lady disappeared from before their very eyes, and without their seeing what did it. Out through the door of the palace went Guleesh, the princess, and the fairy men without being stopped, for nobody saw them go. Every one of the fairy men called out, "My horse, my bridle, my saddle!" Guleesh called also, "My horse, my bridle, my saddle!" At that moment the horse was standing ready before him. "Now jump up, Guleesh," said the little man, "and put the lady behind you. We must be going. The morning is not far off from us now!" So Guleesh took her and raised her up behind him. 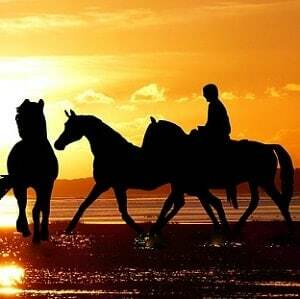 With a flick of the reins his horse, and the other horses with him, went in a full race until they came to the ocean. "Hie over cap!" said every last one of them. "Hie over cap!" said Guleesh. With these words, each of the horses rose up, leaped over the sea, and came down on dry land back in Ireland, to be sure. They did not stop there, but raced to the place near Guleesh's house where the old rath fort stood. And when they came as far as the rath, Guleesh suddenly turned, took the young girl in his two arms, and leaped off the horse. The fairy men called out when they saw what Guleesh had done. "Guleesh, you clown, you thief! That no good may happen to you! Why did you play such a trick on us?" But they had no power at all to carry off the girl, after Guleesh had leaped off the horse with her. "What good have we now out of our journey to France?" called one fairy man. "Never mind," said another. "You'll pay us back another time for this!" "He'll have no good to get out of that young girl," said another fairy man as he passed over the princess. He uttered a few magic words and clapped his hands once. "She'll be without talk from now on," said he. "What good will she be to you now?" Before Guleesh could answer, he and the rest of the fairy men had disappeared from the rath and out of sight. Guleesh turned to Princess Isabel. He said, "Thank goodness, they're gone. Would you not rather stay with me than with them?" She turned her head and gave no answer. "There's trouble and grief on her mind yet," thought Guleesh. This time he spoke more gently. "I am afraid that you must spend this night in my father's house, lady. If there is anything that I can do for you, why you just tell me, and I'll be your servant." The princess remained silent. Her face was white, yet she stood tall. "Lady," urged Guleesh, "tell me what you would like me to do! I never belonged to that lot of fairy men who carried you away. I am the son of an honest farmer, and I went with them without knowing what they were planning to do. If I could send you back to your father this very moment, I'd do it." He looked into her face, and he saw her mouth moving as if she wanted to speak, but no words came out. "Did I not hear you speaking to the king's son in the palace tonight?" said Guleesh, "Or has that nasty fairy man made you really without speech, when he spoke those words and clapped his hands?" The girl raised her hand and laid her finger on her tongue to show him that she had lost her voice. Guleesh could not stand the sight of the young girl in such an unhappy plight. He began to wonder what he ought to do. He did not want to bring her home to his father's house. Despite her fine clothes, he knew very well that they would not believe that he had been to France and had brought back with him the daughter of the king. He feared they would tease the young lady, maybe even insult her. "I know what I'll do," he said finally, "I'll bring her to my grandmother's house." He turned to the princess and explained that his grandmother would take good care of her, but that if there was any other place she would rather go, he said he would bring her to it, if he could. She nodded her head to show him she was willing. They walked together to his grandmother's hut. The sun was just rising when they arrived at her door. Guleesh knocked on the door. As early as it was, the grandmother was already awake. "Guleesh, Guleesh, aren't you the nice boy to visit me, but that you must be coming at this hour?" The grandmother looked at the young girl in all her finery. "Now what have you here? Who is this fine maiden, or how did you come by her?" "I'm not telling a word of lie, nor making a joke of you," said Guleesh, "but she is the daughter of the king of France." Then Guleesh told the whole story to his grandmother, about how he had gone off in the night with the fairy men and how before he knew it they had kidnapped the daughter of the king of France. And how he had finally gotten her away from the nasty fairy men but then one of them had put a spell on her so she couldn't speak anymore. And now what to do? The grandmother was so much surprised that she could not help calling out at times, or clapping her hands together. When Guleesh said that he would be very thankful to his grandmother if she would just keep the girl for awhile, the kind old lady said she would be happy to do that for as long as Guleesh wanted. Though the grandmother nor Guleesh knew how long she would need to stay there, or how they would be able to send her back home again, if ever they could. They decided the grandmother would let on that the girl was the daughter of an old friend she had, who was coming on a visit from another county. The grandmother would tell everyone that the girl couldn't speak, and do her best to keep everyone away from her. Of course, they would change her clothes to the simple frocks worn in Guleesh's town. The princess showed by her eyes that it was a good idea, at least as good an idea as any of them could think of, for the time being. Guleesh went home. When his family asked where he had been all night, he said that he had fallen asleep outside by the rath. There was great wonderment on the grandmother's neighbors at the strange girl who came so suddenly to the old woman's house without anyone knowing where she was from, or what business she had there. Some of the people said that it was a great story, how all of a sudden Guleesh was forever visiting his grandmother's house. That was true, indeed. For as often as he could, Guleesh would steal away to his grandmother's house and have a talk with her guest. Since the maiden had no other means of talking, she carried on a sort of conversation between herself and him, by moving her hand and fingers, winking her eyes, opening and shutting her mouth, laughing or smiling, and a thousand other signs. It was not long until they understood each other very well. Guleesh was always thinking how he could get her back to her father. But he did not know what road to go, for he had never been out of his own country and the night he went there, they had flown through the air on the magic horses. His grandmother did not have any ideas, either. Nevertheless Guleesh wrote a number of letters to the king of France and gave them to traveling merchants who said they were headed across the sea, perhaps to France. But all letters went astray, and never a one came to the king's hand. So it went for many months. Guleesh and the princess were falling in love, more and more every day. The boy feared greatly at last, lest the king should indeed receive one of his letters after all, and then find out where his daughter really was, and order her back to France. Still, he continued to write letters headed to France, though he did so less and less often. So they passed the time for a year. One day, Guleesh was lying by himself on the grass, on the last day of the last month in autumn. Suddenly, he remembered that it had been a certain November night that he had been standing at the rath when the whirlwind had come, and the fairy men in the whirlwind. He said to himself, "We will have that same November night again today! I'll stand by the rath tonight. maybe the fairy men will come again. I may see or hear something that could be useful to know, or could help me bring back the Princess' voice." Guleesh went to the old rath when the night was darkening, and waited there for midnight to arrive. The night was as calm as a lake is when there is not a breath of wind to move a wave on it. He stood there for an hour, for two hours, then three. He was thinking that the fairy men would not come that night and that he might as well return home, when he heard a sound far away from him, coming toward him. At once, he recognized what it was. At first it was like the beating of waves on a stony shore, and then it was like the falling of a great waterfall, and at last it was like a loud storm in the tops of the trees, and then the whirlwind burst into the rath, and the fairy men were in it. It all went by him so suddenly that he lost his breath. But he came to himself on the spot, and listened carefully. Scarcely had they gathered around the rath that they all began shouting and screaming among themselves. Each one of them cried out, "My horse, my bridle and saddle!" But then another little man cried out, "Guleesh! My boy, is it you again? How are you getting on with the princess? There's no use in you calling for your horse tonight. You won't play such a trick on us again!" "Isn't he a prime lad!" said another fairy man. "To take care of a woman all year who has never said as much to him as, 'How do you do?'" "The joke's on him," said the voice of a third man. "He doesn't even know there's an herb growing up by his own door that if he were to boil and give it to her, she'd be well." "Forget about the lad," said another voice. "Let's be on our way." And with that, they rose up into the air and out with them the way they came. Guleesh stood there for awhile, thinking in his own mind on all he saw and heard, and wondering if there was really an herb at his own door that could bring back speech to the king's daughter. "It couldn't be," he thought, "that they would tell it to me, if there was any truth in it. But maybe the fairy man wasn't watching himself when he let the word slip out of his mouth. I'll look as soon as the sun rises and see if there's any plant growing beside the house except the usual weeds." At daybreak, he got up. It was the first thing he did to go out and search well through the grass round about the house, trying to find any herb he did not recognize. And indeed, he was not long searching till he discovered a large strange herb growing up just by the edge of the house. He went over to it and observed it closely. He saw that there were seven little branches coming out of the stalk, and seven leaves growing on each little branch, and that there was a white sap in the leaves. "It's very strange," said he to himself, "that I never noticed this herb before. If there's any power in an herb at all, it would be in such a strange one as this." He drew out his knife, cut the plant, and carried it into his own house, stripped the leaves off and cut up the stalk. There came a thick, white juice out of it. He put the stalk and the leaves in a little pot and a little water in it, and laid it on the fire until the tea was boiling. Then he filled a cup with the juice. Just then, it came into his head that perhaps it was poison that was in it, and that the little people were only tempting him that he might drink the poison tea, or even put the girl to death without meaning to. He put down the cup, raised a couple of drops on the top of his finger, and put the drops to his mouth. The tea was not bitter and, indeed, had a sweet, agreeable taste. He grew bolder then, and drank a small swallow of it, and then as much again, till he had drunk half the cup. He fell asleep after that, and did not wake till the next morning. When dawn broke, he went over to his grandmother's house with the drink in his hand. He never felt himself so bold, strong, spirited and light, as he was that day. He was quite certain that it was the drink he drank that made him feel so hearty. When he came to the house, he found his grandmother and the young lady inside. They were wondering greatly why he had not visited them at all the day before. He told them all his news, and said that he was certain that there was great power in the herb, and that it would do the lady no harm, for he had tried it himself and only got good from it. Then Guleesh handed her the cup. The lady drank it, and then she fell back on her bed and a heavy sleep came upon her. Both Guleesh and his grandmother sat up the entire night with her, waiting till she should awaken, and they between hope and unhope, between expectation of saving her and the fear they may have hurt her instead. She slept for the entire next day. When the sun set, she awoke at last. She rubbed her eyes and looked like a person who did not know where she was. Both were in great anxiety waiting to see whether she would speak, or not speak. Guleesh finally said, "Did you sleep well, Princess?" And she answered, "I slept, thank you." No sooner did Guleesh hear her talking than he put a shout of joy and ran over to her and fell on his two knees. "Lady of my heart, speak again to me!" The lady answered that she knew that it was he who had boiled the drink for her and gave it to her, that she was greatly obliged to him for all the kindnesses he had shown her since the day she first landed in Ireland, and that he should be certain that she never would forget it. Guleesh was ready to die with satisfaction and delight. The grandmother brought her food and she ate with a good appetite, and they were all merry and joyous. After that, Guleesh would visit her several times a day. He spent so much time at his grandmother's house they all agreed it was best if the two of them should marry. So they married one another, and that was the fine wedding they had. It so happened that one of the letters Guleesh had sent to the king had actually reached the king. He sent a messenger to Guleesh's county to locate his daughter. The messenger found her happily married and returned word of this event to the king. The king, who had been grieving ever since his daughter had so mysteriously disappeared, was delighted to find out that she was not only discovered alive and healthy, but was happily married as well. He immediately dispatched a grand, royal wedding gift along with his best wishes for her future happiness, and many promises to visit her frequently in the years ahead. Though you might search the wide world over, they say, you will never find another happier pair than Guleesh and his bride Isabel. Question 1: Why did Guleesh go to such trouble to take care of the speechless princess? Question 2: When did the princess fall in love with Guleesh, too? The story is adapted from Guleesh from Celtic Fairy Tales by Jacob Josephs, 1892. The story of "Guleesh" is found with a number of variations in Irish folklore. In one version, "Gilly" from Tales for the Telling: Irish Folk & Fairy Stories (Athenaeum, New York, 1986), our hero has the name Gilly Blackfoot, and he rides off with a group of fairies.